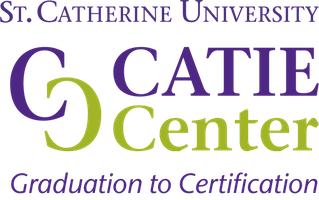 The CATIE Center at St. Catherine University has a five year federal grant award (U.S. Department of Education, Rehabilitation Services Administration H160C160001) to increase the number of certified interpreters and to reduce the average length of time it takes for novice interpreters to become nationally certified. To achieve these outcomes, we are tasked with developing, piloting, evaluating, and disseminating evidence-based practices for supporting recent BA graduates in their entry to practice. Approaches developed need to be replicable and sustainable. The grant is run on the calendar year, January to December. During this first year (2017), our focus was on program development. In year two (2018), we will have one pilot cohort of 14 participants from across the nation. Based on pre-assessment, post-assessment, RID test results and other data, we will evaluate and revise the program for the final three years (2019 – 2021). In each of those years, there will be three cohorts of 10 – 14 participants. Each year we will evaluate the program. In addition to the cohorts who participate in the program, each year we will have have a comparison group of the same number. These novices will take the same pre- and post- tests (including the RID performance test) but will not take the program. We will use the data collected to provide evidence for what works (or doesn’t work) in our approaches and share that with the field. All assessments and testing will be paid for by the CATIE Center. Fees for the GTC program will be low, with fees waived as needed. This is an excerpt of an interview with Peter C. Brown and Patricia Gordon. The CATIE Center is working on creating ASL translations of this material. Frequent use of low-stakes assessments and quizzes: These are designed to both help a participant assess where they are at, but also to trigger the process of forced retrieval – which is an important activity for moving a knowledge or skill into long-term memory. Spaced learning: Allowing enough time to pass between working on a skill so that you begin to forget and the act of retrieval is more difficult. Interleaving activities: Mixing work on different skills and knowledge into lessons, rather than only working on one thing at a time. Doing dedicated practice leads to the illusion of mastery of a skill. However, the mastery may actually only be in short-term memory loops or may only be there when it is that single skill that is focused on. These skills need to be available when there are other demands, which can be addressed through interleaving. In just the last three months we have conducted focus groups, interviews, an online Think Tank, read the literature, and reviewed resources. From this, we have hundreds of pages of input from stakeholders across the country. Stakeholders have included recent IEP graduates, as well as pre-certified and certified interpreters, with experience ranging from less than 10 years to 35+ years. Mentors, educators, researchers, administrators, employers, and practitioners—Deaf, hearing, and from diverse communities—have given input. The resources and curriculum developed by previous RSA grant projects including the National Multicultural Project, TIEM National Center, DO IT Center, NCIEC, NIEC, CATIE Center, MARIE Center, NURIEC, GURIEC, WRIEC. Mentoring and apprenticeship programs – New Brunswick (NB Stage), TIEM, Gallaudet University and NTID. We are currently planning a larger gathering of interpreter educators this fall in partnership with VRSII and CIT. Watch for information. If you teach in an interpreter education program, we need your help in promoting this opportunity to your students. This program is designed for novice interpreters who are within one year of their graduation from an interpreting program, and are planning to work with adults and aim to earn working toward obtaining RID certification. We are also looking to increase representation in interpreting from specific groups: people of color, men, and people living in rural areas. If you want more specific information, would like promotional material you can share with your students, would like to be alerted when resources are available for distribution, or want to join in our discussions of how to transform interpreter education, please use our contact form. The Graduation to Certification program is still a work in progress, but we look forward to sharing information and resources as they are developed.